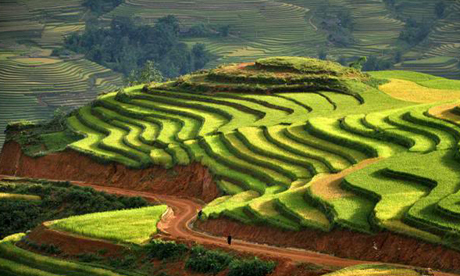 Rows of rice terraces are a continual feature on any ride through northern Vietnam. 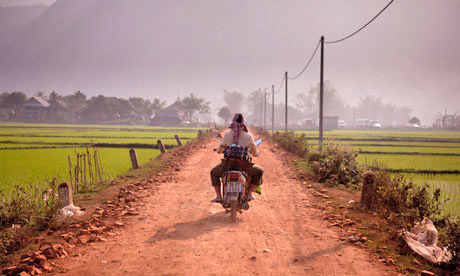 A local rides through paddy fields in Hoa Binh province, northern Vietnam. With little chance to dwell on the fall and already far from civilization, I had simply but shakily climbed back on the bike and, following Dang Van Diep, our smiling, non-English-speaking mechanic, soldiered on. The Russian-made motorbikes outside the homestay in the village of Ban Hieu. 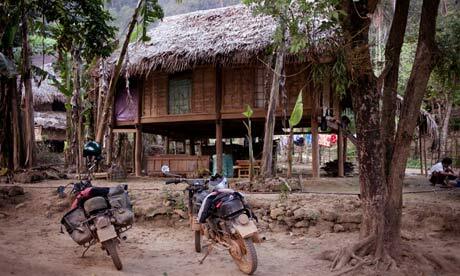 We spent the first night in Mai Chau, a scenic village without roads 135km from Hanoi that is quickly being discovered by tourists looking for somewhere off the beaten path.. That night, after 10 hours on the bikes, we arrived at the truly isolated Ban Hieu. • Hire motorbikes and all-inclusive organized tours can be arranged through tour companies such as Ride Ho Chi Minh Trail (www.ridehochiminhtrail.com).